BANGKOK -- Competition in Thailand's pickup truck market is intensifying. The country is also a key export base for these trucks, which might explain why Mitsubishi Motors makes its Triton pickup in Thailand and nowhere else. Mitsubishi first launched the Triton nine years ago but recently unveiled a remodeled version that it plans to sell in 150 countries and regions. "The Triton is one of our most important products," Chairman and CEO Osamu Masuko said. "It has contributed the most to our revitalization." When Mitsubishi introduced the Triton in 2005, the company was in turmoil due to a cancelled tie-up with Germany's Daimler and revelations that vehicle defects had been covered up to avoid recalls. Mitsubishi nearly went out of business but was saved by its Thai operations -- and by the Triton. In the past nine years, 1.26 million Tritons have been sold, accounting for nearly 20% of Mitsubishi's global sales. The new Triton, which went on sale Nov. 18 in Thailand, costs between 791,000 baht ($24,117) and a little over 1 million baht. The Triton line offers three pickups with different engines. The cabin is also roomier than that of its predecessor. Early next year, Mitsubishi will start exporting the new model to other Southeast Asian nations, Latin America and the Middle East. It is aiming for global sales of 200,000 units a year. 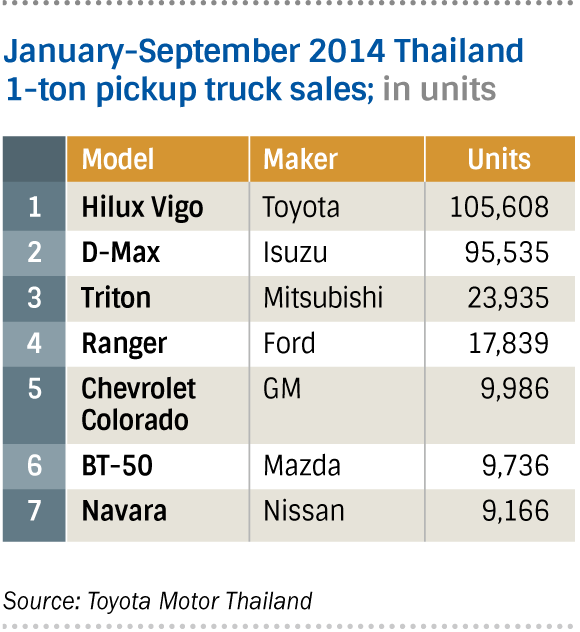 Large pickup trucks are mainstream in the U.S., but compact models are more popular in Thailand. Some 1.6 million 1-ton pickups are sold globally each year. Thailand is regarded as the home of smaller pickup trucks, accounting for more than 70% of production and 30% of global sales. A number of Japanese automakers have set up operations in Thailand, drawn by the preferential excise levy on trucks. 1-ton pickup trucks attract a 3-12% levy, compared with 17-50% for passenger cars. 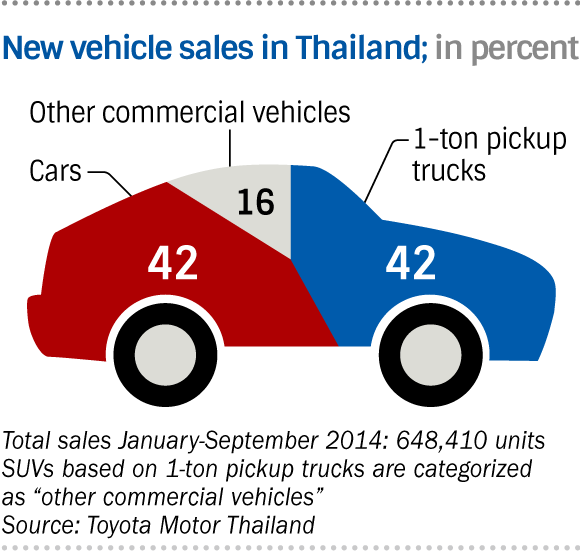 As a result, the trucks make up more than 40% of new-vehicle sales in Thailand. Another factor behind Thailand's rise as an automaking hub was the Asian currency crisis of 1997. As demand in the region plunged, Japanese automakers consolidated their Southeast Asian factories, with Thailand ending up the winner. The economic boom that followed in emerging countries sharply boosted demand for pickup trucks, turning Thailand into a major exporter. Today, eight automakers -- five Japanese, two from the U.S. and India's Tata Motors -- manufacture pickup trucks in Thailand. Compared with passenger cars, which are redesigned every four or five years, pickup trucks have a longer product life, making them "extremely profitable," said a major Japanese auto executive. 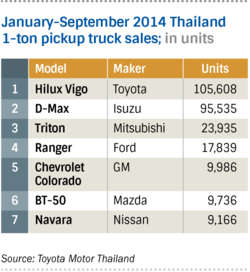 Consequently, competition among Japanese carmakers has been heating up. Toyota Motor in June received approval from the Thai government to invest about 51.5 billion baht in 1-ton pickup truck operations. The company is revamping its Hilux Vigo for the first time in 11 years and plans to launch the remodeled version next year. Nissan Motor in July updated the Navara pickup truck for the first time in seven and a half years. But the new models are coming as the Thai pickup market faces a major change -- a new excise tax regime is in the cards. Beginning in 2016, the government plans to calculate the levy on vehicles based on fuel economy, not engine displacement. For 1-ton pickups, the levy will increase by 2 to 3 percentage points if their carbon dioxide emissions per kilometer exceed 200 grams. By contrast, the levy on fuel-efficient small cars will drop 3 to 5 percentage points from 17%, narrowing the gap with pickups. Behind the change is the government's desire to steer domestic demand toward greener vehicles. The mostly diesel-powered pickups are so popular in Thailand that the country consumes twice as much diesel than gas. Boosting sales of gas-sipping cars will not only reduce diesel imports but also encourage more car production. It could also bring greater export opportunities. For Mitsubishi Motors, the new excise levy is unlikely to have much of an impact, as the new Triton's carbon dioxide emissions per kilometer are less than 200 grams. However, the new regime will draw consumers' attention to fuel economy, which automakers are not required to disclose under Thai law. That means fuel efficiency will become a key factor in determining a vehicle's success in Thailand. Tokopedia founder hopes so: Can Silicon Valley be replicated in Indonesia? Copyright © 2015 Nikkei Inc. All rights reserved.